The ACC isn’t exactly known for its plethora of intimidating stadiums, nonetheless, I love traveling along with my alma mater for road games. With trips to Carter-Finley in Raleigh and Byrd in College Park this season, I can now say I’ve visited every ACC Charter member’s stadium in addition to some others. Below, I’ve shared my take on the stadium experience at each of the venues I’ve visited and ranked them. I’ve left out the four ACC Stadiums I’ve never visited (BC, Syracuse, Pitt, VT) so you’ll notice the countdown starts at 10. Admittedly, this is purely subjective–I’m no architect–so don’t get too bent out of shape, but do share your experiences in the comments below. Rankings consider both stadium appearance and ambiance. For a full rundown of every stadium in the 2014 ACC lineup, including Louisville, visit my comprehensive list on Sports-Kings.com. Here’s how I rank the 10 venues I’ve visited in the current ACC. I’ve visited the humble confines of Wallace-Wade on multiple occasions and each time the visiting crowd outnumbered (and more notably out-cheered) the Blue Devil faithful. That makes for a fun road trip, but not a very impressive home venue. More to the point though, Wallace Wade is so small and quaint it isn’t really up to FBS standards. It is setup like a pit rather than an imposing stadium. You very well could be walking by and then realize you’re standing at the top of the stadium. Maybe that’s why I’ve run into students asking where Wallace Wade is located on more than one occasion. It also has a track surrounding the field which looks horrible and pushes the fans away from the action, but it is set to be removed as renovations take place at the conclusion of the 2013 football season. That’ll help a lot. The food is also incredibly cheap for a sports venue. I feel obligated to buy something just because it’s such a good deal. 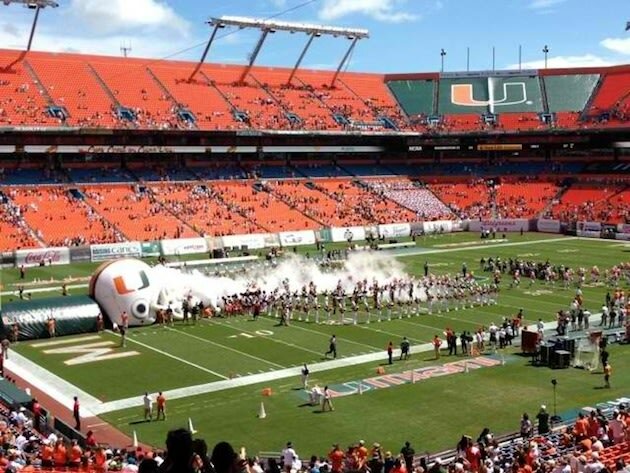 Although the Hurricanes are in the middle of the conference pack in attendance, their stadium–whose name changes more than Oregon Duck uniforms–is simply nothing special. When I visited for the 2011 Orange Bowl, I expected a complete dump, but it really wasn’t awful. There’s was just nothing special about it, save the palm trees outside the stadium. It’s a big professional dual-sport stadium that they can’t fill and have to use large tarps to covers sections of seats. Luckily the Marlins have moved away so the base path isn’t awkwardly cutting through the field anymore. Sun Life Stadium is a whopping 20 miles from campus, about 14 miles further out than the old Orange Bowl Stadium. One forgets that the University of Miami is actually a fairly small and prestigious private school with a total undergraduate enrollment just barely over 10,000. Their 74,916 stadium is too big for them, especially with it being so far from campus, and the empty seats look ridiculous. If feasible, they’d be well served to erect a smaller on-campus stadium with more character. A tarp covers some of the less desirable seats in a mostly empty Sun Life Stadium. 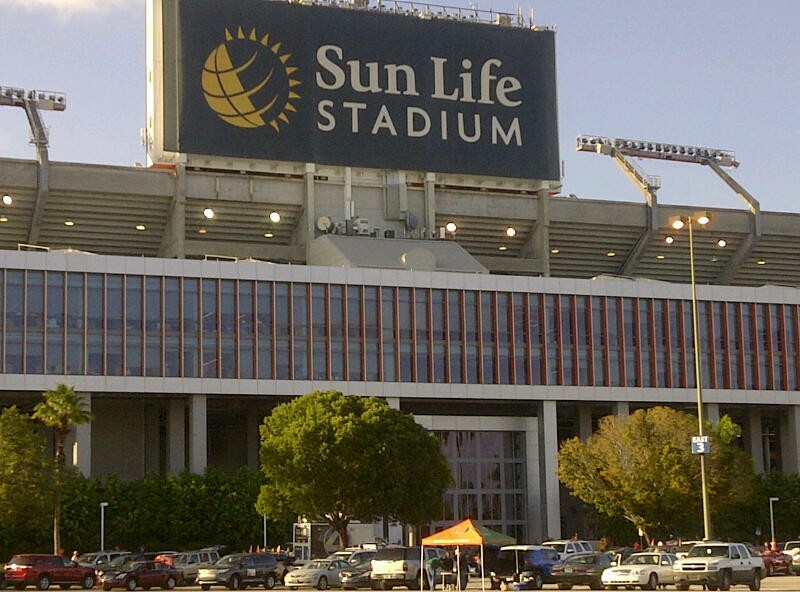 Sun Life Stadium on the morning of the 2011 Orange Bowl. After this season’s long trip to Maryland I can finally claim to have visit every ACC charter member stadium (Including SC). Byrd was fine, they had a nice structure in one end zone and the other was bowled in. It was a little dingy and the concourse was very poor, but nothing too terrible. Their field turf looks bad. For whatever reason it looks more fake than Wake Forest’s. They had an awkward tailgate turtle in the corner which was weird. You know, one of the giant inflatable mascots people have at tailgates. The crowd was decent sized (48,134), but it was pretty quiet. They told everyone to stay in their seats at one point for a crowd stunt. I was expecting one of those card stunts where the crowd makes a picture with a mosaic of poster boards, but they just pulled two big Maryland flag banners down the student section. Man, they are obsessed with that thing. One positive is that there isn’t a bad seat in the house. The views from the upper deck are unobstructed and you can even see the Washington Monument and Capital Building which was unexpected. In 2008 I visited Winston-Salem for the first time (I now live there) amid a fan blackout and a packed house. They beat a mediocre Clemson team, and Tommy Bowden stepped down the following Monday. It was an impressive showing, but since then, Grobe’s program has crumbled and fan support has dwindled. Believe it or not, Jim Grobe actually has a losing record at Wake Forest now. I visited again for a Thursday night game in 2012 and the atmosphere was much more subdued. The single-decker stadium is small, but nice. A recent project added “Deacon Tower” which did a lot for the overall appeal of the venue, making it look much less dinky. They play on FieldTurf, which looks great on TV, but the end zones look a little off in person. Overall, a nice enough stadium, but very small and sparsely attended. 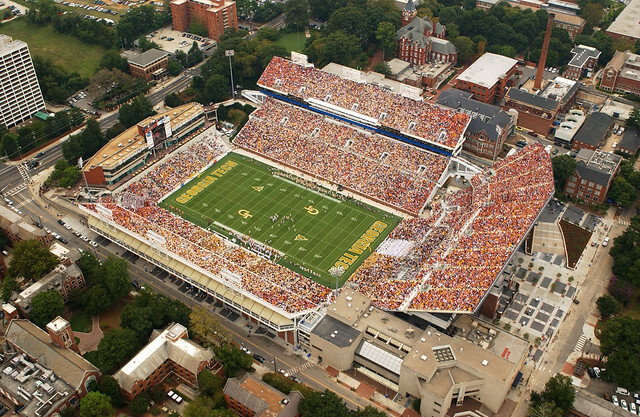 There are two ways to look at Bobby Dodd Stadium–old and dingy or historic and majestic. The history of the stadium is an intriguing aspect. That said, it is a rather unattractive structure that suffers from the same pit style layout as Wallace Wide. Only its upper deck protrudes above ground level, making for an extremely underwhelming view from the outside. Each time I’ve been (2007, 2009, 2011) I’ve sat in the upper endzone which is rather far from the action. Given it’s modest capacity (55,000) and view from the outside, you’d expect to be closer to the action. The upside of being in the nosebleeds is the sight lines of downtown Atlanta. They truly are impressive. While the crowds are quick to quiet down, they’ll also get loud for a big third down stop. The “Budweiser Song” gives everyone a laugh before the fourth quarter starts as the students and most of the crowd join in on bobbing up and down and singing about beer. The student section is a little, odd. They seem to have their own quirky personality and inside jokes including dancing bananas and robot costumes, but they are there and having fun so I am all about it. 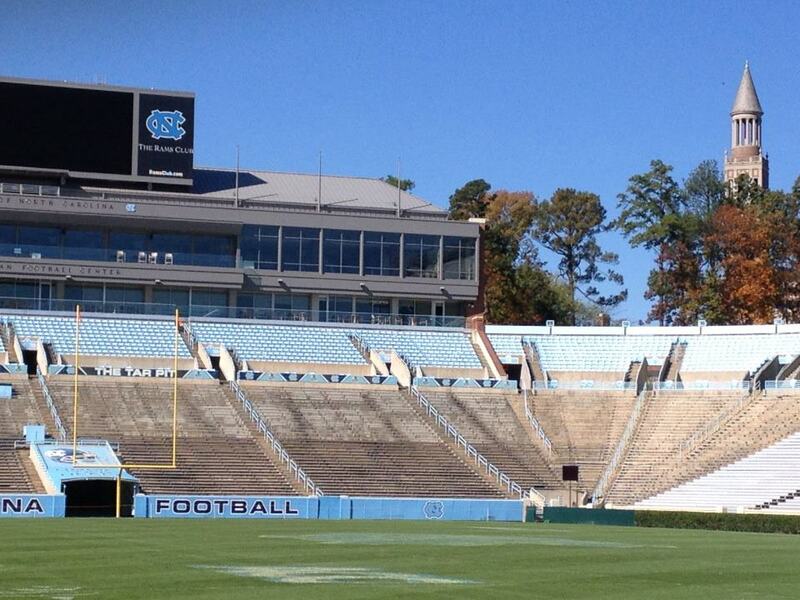 UNC-CarrboroChapel Hill’s Kenan Memorial Stadium bears a striking resemblance to UGA’s Stanford Stadium. They even have the hedges surrounding the field, though Georgia’s were more purposefully maintained. It wasn’t just smaller though, it was also not as nice. 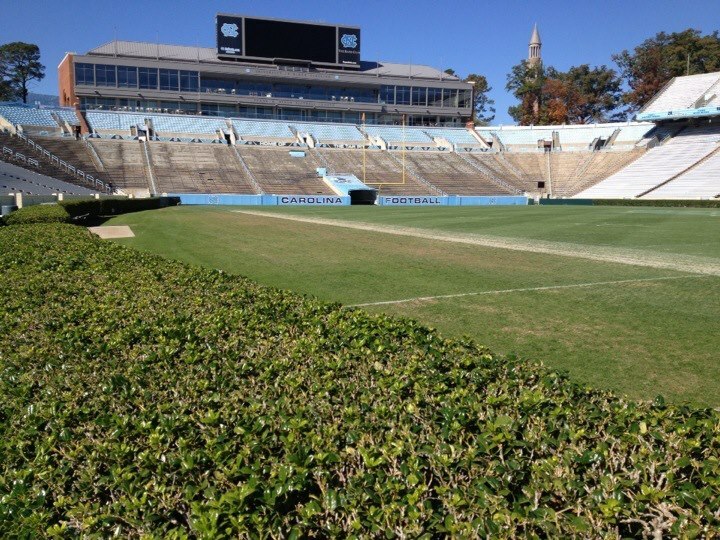 The powder blue seats are faded, the hedges are scraggly, and the Continental Tire Bowl signs are a bit silly. The resemblance is fitting, as Chapel Hill reminds me a lot of a quaint Athens. I toured the stadium and town while the Heels were on bye so I can’t criticize, but most say the atmosphere is lacking. It seats 62,980 which is a decent size and all they need given the average attendance. Unforunately a great deal of those seats are of the bleacher variety. The stadium is in a nice area of campus. So nice In fact that ESPN Blogger, Heather Dinich, calls Kenan Memorial ”one of the most picturesque places to watch a game,” and from the picture below you can see what she means. It’s a quality facility in a nice area. They’re also working on renovations to further improve the amenities. The stories you hear about the wine and cheese crowd in Charlottesville are true. You’ll see more than your fair share of men wearing scarves and drinking Cabernet at tailgates. Fans are very polite and Scott Stadium is just lovely. It holds 61,500 and was mostly full when I visited in 2008. 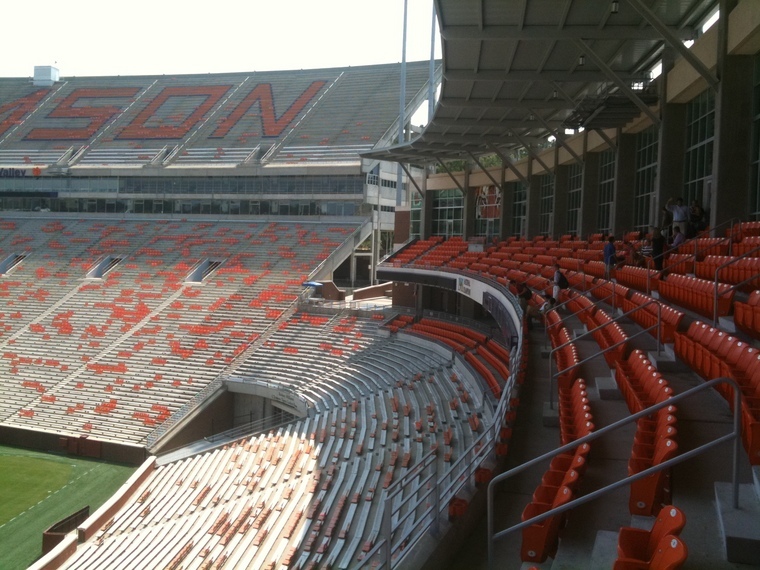 One endzone is horseshoed in on both decks while the other has a hill where fans can sit, but unlike Clemson, fans sit (sometimes with blankets) peacefully there. The hill is outlined with white columns that add some personality. It’s a beautiful venue, but not an especially tough place to play. One interesting tidbit you’ll notice if you visit are the subtle hints at the secret societies originating in the area eons ago. Carter-Finley is the most underrated venue I’ve ever visited. After a Thursday Night game in Raleigh, Clemson QB, Tajh Boyd, said it was a “crazy atmosphere,” big kudos from someone used to playing in Death Valley. Given the large tailgate scene, the strong attendance, the quality of facilities (they are working on an indoor practice facility), and the culture that values football, not just basketball, NC State is a sleeping giant. It’s amazing they’ve never found much sustained success despite great coaches like Monte Kiffin and Lou Holtz. They claim “We Own This State” (see picture below). Of course, it is still called “the Tar Heel State,” but when it comes to the gridiron, this should be the case. 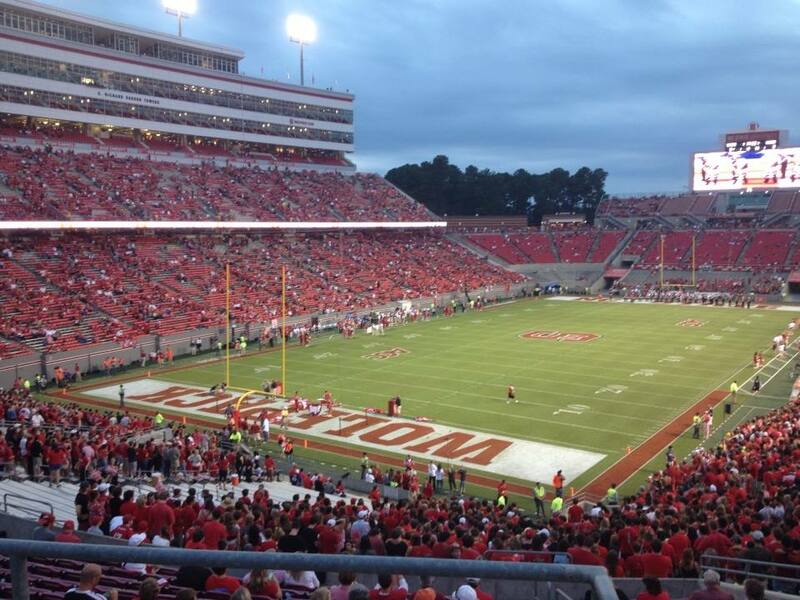 Carter-Finley isn’t huge, (capacity a shade under 60,000) but they fill it up, which is preferable to a slightly higher attendance with a bevy of empty seats. A huge portion of that attendance is from the student population–reminding you that the university has an enrollment of nearly 35,000. Fans can be a overtly rude and rough around the edges, but they’re spirited and loud. Despite being an double-decker, there’s not a bad seat in the house, with good sight lines, you’re always close to the action. Carter-Finley has the smallest clearance between the stands and the field of play in the conference. While Carter-Finley falls short of the top two teams on this list, Pack fans have reason to be proud. 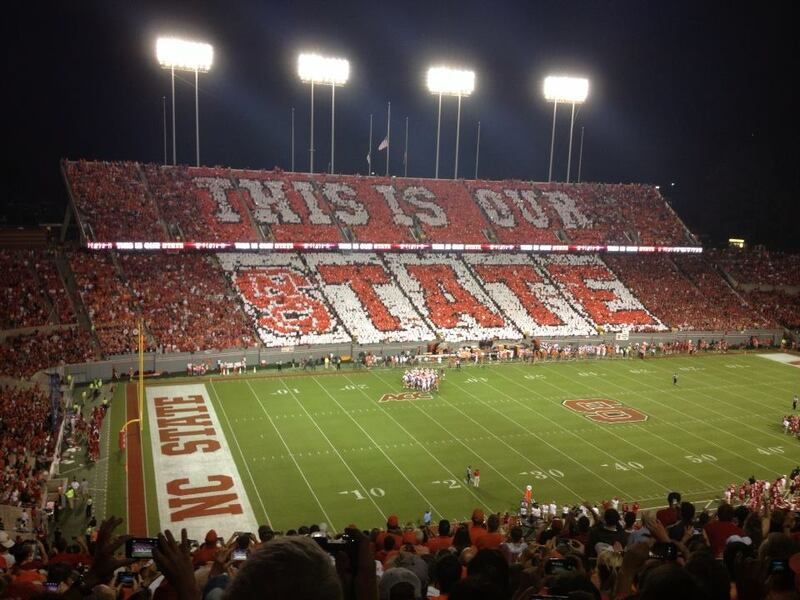 NC State fans claim “THIS IS OUR STATE” with a card stunt between the first and second quarter of a 2013 home game. With ornate brickwork and beautiful surrounding fountains, the outside of Doak Campbell stadium is the most impressive I’ve ever seen. Conversely, on the inside, FSU’s single-decker stadium is a big, bland bowl. “The Doak” can get pretty loud, especially when Chief Osceola rides in on his horse, Renegade, before kickoff. His famous spear plant is one of the coolest traditions in college football, and although fans can be rude and the war chant takes the cake as the most repetitive chant in college football the pageantry is top-notch and the stadium is among the best. Between the hill, the rock, and the 84,000 screaming orange-clad fans, “Death Valley” has it all. It has the highest average attendance and is widely acknowledged as the loudest in the conference. In fact, fans there set the record for the loudest decibel level in a college football game (since broken). It’s not just a big ugly, intimidating behemoth either. 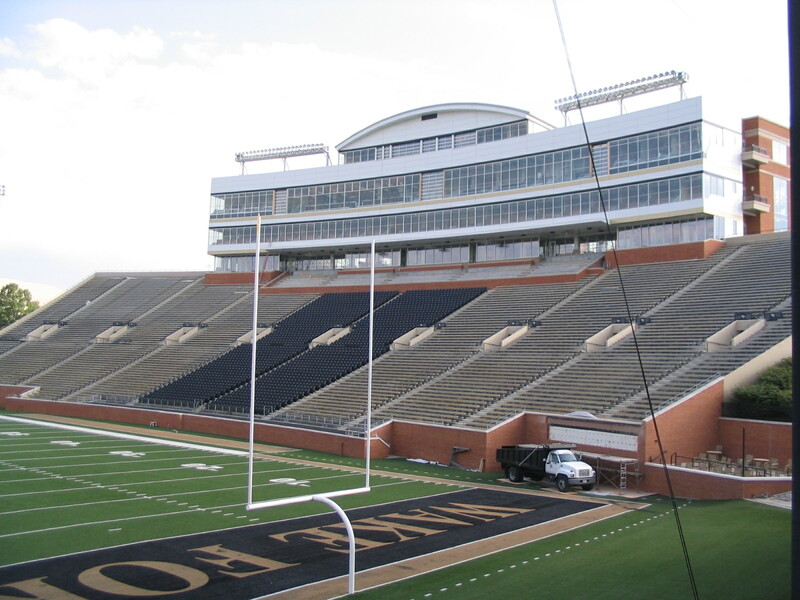 The West Endzone Project has remodeled the seating opposite the famous hill to add high-end shaded seats. Luxury suites are situated between the decks and a beautiful tree is stands near the hill, adding a touch of nature and washing away the concrete jungle feel that so many large stadiums have. More improvements are on the way as suites will be upgraded and the West Endzone will see more additions. Fans consistently fill the stadium with only the rare empty corner in the upper decks, but before entering the stadium they tailgate like no other. In fact, Clemson won the “South’s Best Tailgate” according to Southern Living Magazine. Once in the stadium, the tradition and pageantry is unrivaled across the conference. Before each game the Tigers rub “the Rock” that sit atop the hill, symbolizing their promise to give 110% effort before a canon fires and the team runs down the hill. You’d be hard pressed to find anyone outside of Tallahassee that wouldn’t call Death Valley the most impressive venue in the Atlantic Coast Conference. Now if you haven’t seen the Tigers run down the hill, check out the ESPN video below, or I’ve written this post in vain. The West Endzone offers a shaded area with permanent seat backs. Future plans include a Clemson Football Museum. All attendance figures are 2012 and courtesy ESPN.